Skirt & Fitted Top for Genesis 2 Female for use in Daz Studio 4.6 & Newer. 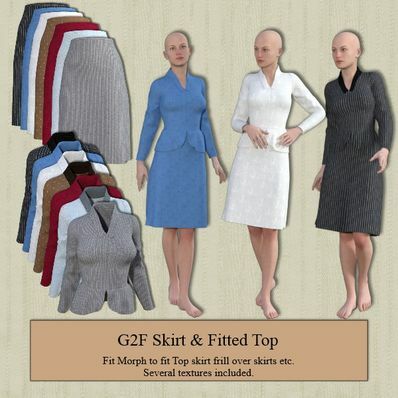 Fit Morph to fit Top Skirt Frill over skirts included. I have also included several Textures. Thank you so much! These are awesome!!! thank u very much for these sharing! You always make quality products!!!! Absolutely classy. Thank you very much! Thanks muchly Wilmap. Lovely Autumn wear. Thank you very much! Looks wonderful! Another fine work, thank you! I don't think I say it enough: You Are Awesome! Thank you, thank you, thank you. Thank you Wilmap's LOVE your Items. yes yes, very nice indeed. Thank you -- yet another lovely creation.